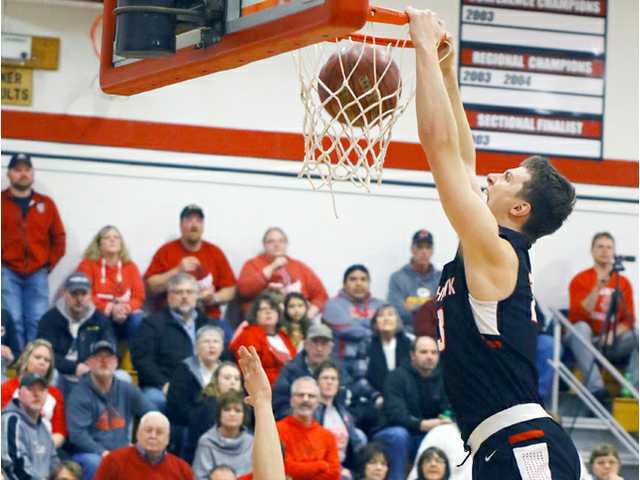 POSTED January 10, 2019 10:27 a.m.
SOUTH WAYNE — For more than 30 years, the Black Hawk boys’ basketball scoring record has belonged to a Meyer. That record changed hands on Thursday night, but remained within the Meyer household as senior Conner Meyer passed by his father, Craig, to become the Warriors’ all-time leading scorer. Sitting 28 points behind his father coming into the game, Conner poured in a game-high 30 points in the Warriors’ 79-41 Six Rivers East victory over Juda to set the record in front of the home crowd and, of course, his father on Thursday, Jan. 3. Craig starred at Black Hawk High School from 1986-90 and when he graduated he owned the boys’ scoring record with 1,413 points. He went on to play college basketball at Loyola University and UW-Milwaukee. “I didn't think it would hurt (losing the record to his son), but after some of the conversations we’ve had around the supper table it did sting a bit,” joked Craig. Conner has played on varsity since his freshman season and has averaged nearly 18 points per game during his career. He became the fifth boys’ basketball player in Black Hawk history to top the 1,000-point mark for a career midway through his junior season putting his father’s record well within reach. Following Saturday’s game at Shullsburg, Conner has run his scoring total to 1,431 points; and with more than half his senior season remaining, he sits just 150 points behind Jen Wellnitz’s school record total of 1,580 points for girls’ and boys’ basketball. “It’s my last year and I’m just trying to make the most of it. The records are nice, but I’m making some great memories with the whole team right now,” Conner remarked. The Warriors (4-6 overall, 4-1 SRE) secured their spot atop the East standings with the win over the visiting Panthers on Thursday, Jan. 3. Meyer went off for 22 points in the first half alone to lead the Warriors out to a 41-23 halftime lead, and they kept up their effort on both ends of the floor outscoring the Panthers (0-11, 0-5) in the second half, 38-18, to cruise to a 38-point victory. Senior guard Colby Argall scored 15 of his 20 points in the second half. Senior Kyle Lovelace tallied nine points in the win, while juniors Avery Baumgartner and Lucas Flanagan chipped in with six and five points, respectively, for the Warriors. Dominic Taylor netted 15 points and Gavin Kammerer added 13 for the Panthers. Black Hawk hosts Darlington (10-0) in a non-conference contest on Saturday, Jan. 12, at 2:30 p.m.
Juda – Q. Kammerer 2, Taylor 15, G. Kammerer 13, Yetgin 7, Johnson 4. Totals – 17 0-0 41. Black Hawk – Lucas Flanagan 5, Colby Argall 20, Kyle Lovelace 9, Rece Shelton 4, Sam Meier 3, Chase Stietz 2, Avery Baumgartner 6, Conner Meyer 30. Totals – 34 2-8 79. 3-point goals – J 7 (Taylor 3, G. Kammerer 3, Yetgin 1), BH 9 (Flanagan 1, Argall 4, Lovelace 1, Meier 1, Meyer 2). Total fouls – J 8, BH 10. Fouled out – none.